Carlsbad, Calif. – October 30, 2007 – Pulse~LINK, Inc. announced today that it is the winner of 2007 AeA High Tech Award for Outstanding Emerging Growth. The Ultra Wideband (UWB) semiconductor company was honored for its leading innovation in developing high-performance solutions for whole-home networking of high definition consumer electronics devices. The San Diego chapter of the AeA, one of the industry’s leading trade organizations, announced the top technology winners in the region at its annual luncheon attended by over 650 technology executives. Companies were chosen for innovative technology, market reach, corporate citizenship and achieving important benchmarks. 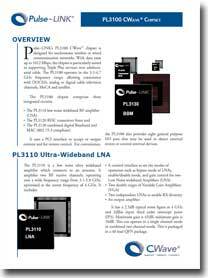 Pulse~LINK is a pioneer in commercialization of UWB communications and the first semiconductor company to deliver a solution capable of true room-to-room networking of interactive High Definition content from a hybrid wired/wireless chipset. Devices enabled with the Pulse~LINK CWave® UWB chipset allow HD content located anywhere in the home to be shared across the existing coax backbone with wireless connectivity in each room for Set-Top Boxes, HDTVs, DVRs, DVD players, Gaming Devices, Media Center PCs, and other multimedia equipment. CWave enables HD content to be streamed throughout the home with IPTV functionality and provides End-to-End Quality of Service, while still preserving content protection mechanisms. Commercial CWave® chipsets will begin shipping this year. AeA, founded in 1943, is a nationwide trade association that represents all segments of the technology industry and is dedicated solely to helping our members’ top line and bottom line. We do this in partnership with our small, medium and large member companies by lobbying governments at the state, federal and international levels, providing access to capital and business opportunities, and offering select business services and networking programs. Additional information about the San Diego AeA Council and the 2007 High Tech Awards can be found at:http://www.aeanet.org/sandiego. Pulse~LINK, Inc. is a privately held Delaware Corporation headquartered in Carlsbad, California, with over 300 issued and pending patents pertaining to UWB wired and wireless communications technology. Pulse~LINK’s CWave® solution delivers up to Gigabit data rates over coax and wireless networks from the same chipset, providing consumers with the unprecedented ability to stream and distribute high quality multimedia content throughout the home. CWave® solutions support simultaneous operation of 1394, Gigabit Ethernet, and HDMI over coax and wireless connections. For additional information about Pulse~LINK, Inc., please visit: http://www.pulselink.net.